Material:Metallic;Memory foam;Comfortable and Non-slip detachable shoulder pad; Adjustable, Replacement,Durable material. Compatible with:Computer Bags;Business Briefcase;Laptop Case;Travel Bag;Violin Case;Tool bag;Duffel bags;Rifle cases;Messenger bag;Kids car seat straps;Gym bag;Camera Bags;Roundup Spray Tank;Work folder that has a shoulder strap; Pet Carrier;Mail Satchel; Boarding Bag; Beach Chairs; Electric Piano Case; Range Bag; Guitar Case;Golf Bag;Triple Trumpet Case;To hold sprayer;Bowling Bag;Folding Bleacher Seats;Under Armor Bag;Canvas Parachute Bag;Gigantic Tennis Bag;Soccer Bag;Goalie bag;Tripod Bag;IPad Carry Case;Pistol Case; To cover worn backpack straps（need buy two);Swiss Gear Bag;Hockey bag;Other shoulder bags. Note:24-month Qishare® Warranty with Amazon 30 days Full Refund Guarantee.If there is any problem,please contact us before leaving a feedback or review. Package Includes:1 x Replacement Strap. 24-month Qishare® Warranty with Amazon 30 days Full Refund Guarantee. Package included:1 x Replacement Shoulder Strap. The Shoulder Strap comes in at 1.5 Inches Wide and allowed to be adjusted from 33 inch to 59 inch(84CM to 150 CM)The easy adjustment in length allows for the perfect fit. The detachable shoulder pad with sufficient padding for the shoulder,more comfortable. Intimate leather ring anti-skid design,with swivel hooks,long enough for cross-body use. Gun black metal hook snaps and adjusting buckle used strengthen version hardware ensures quality,easy to attach and solid. The nylon straps are adjustable via sliding metal buckles on side and secured by friction, assuring a perfect length according to the user's needs. 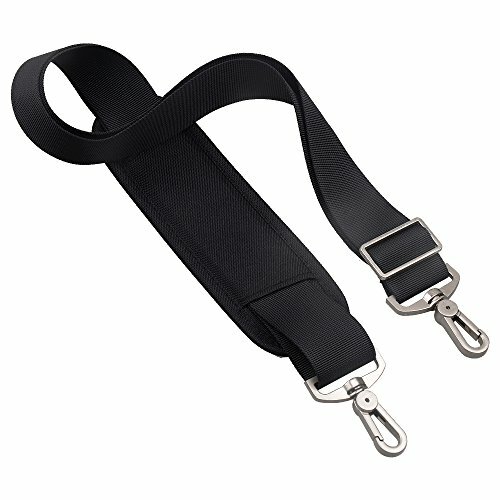 Adjustable replacement belt for those bags that have missing or damaged.Such as Luggage Computer Bags , Duffel bag, Laptop case，Rifle bags, Outdoor Sport Bags,Travel bag, Messenger bags and other shoulder bags.